There are many aspects to security in RapidDeploy. Here we bring them together in one page. 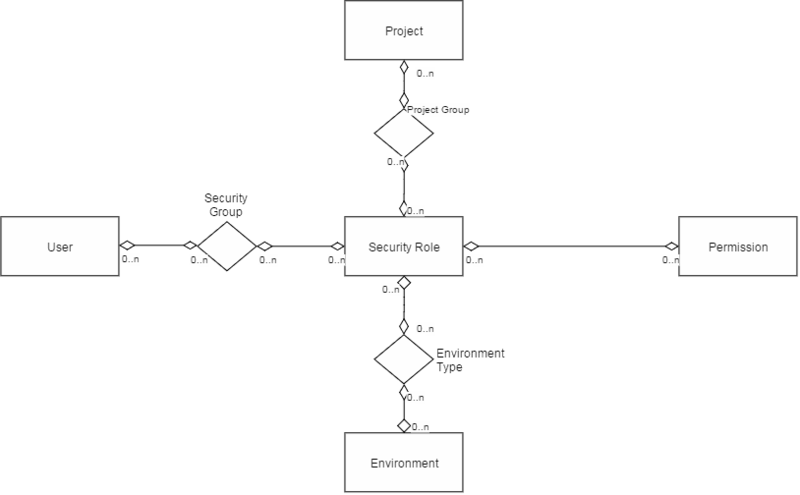 This diagram shows the relationship between Users, Projects and Environments. Application security concerns the constraints placed on the RapidDeploy user depending on the roles that they posess. Every action or feature in RapidDeploy has a Permission. Permissions are not user modifiable, but new permissions may be added in new releases of RapidDeploy. A Security Role is a collection of permissions. Standard roles are provided out of the box, but can be edited or added to by the customer. Roles are assigned to customer defined User (Security) Groups, Project Groups and Environment Types. Users and/or Groups may be sourced from the RapidDeploy Database (default) or from the customers own LDAP Repository. Full details may be found in the documentation site. In order to configure the approvals process in RapidDeploy, you create an ‘Environment Type’ and associate it with one or more ‘Environments’. Further associating this ‘Environment Type’ with one or more ‘Security Groups’, results in any deployment to the target environment requiring an approval. A red approval gate appears in front of any such environment in the release pipeline, as shown in the screenshot to the right. At least one user from each associated security group must approve the deployment, before it is allowed to proceed. Current support for SPNEGO (Kerberos KDC/AD Domain) and SAML. All property fields in RapidDeploy may be set to encrypted and/or password protected. Encrypted fields are stored on the file system in an encrypted format. Password fields are not displayed in the GUI. Web Service Authentication Encrypter tool allows the user to create a token to pass in the header of all web service calls to RapidDeploy Web Services interface. Property Encrypter tool allows the user to encrypt values via the command line as the framework does it internally. ‘Late property Injection’. At job run selection time, any unset dictionary items for the target environment (not set at either project or target scope) will be presented to the user for completion. These may be left blank or filled in. These properties are only held in memory and not written to any file. This is useful where sensitive passwords cannot be stored, even in an encrypted format, in any file. In the screenshot to the right, the red ‘Empty’ field will be used for late property injection. RapidDeploy supports SSH and remote agent communication to/from target deployment targets.